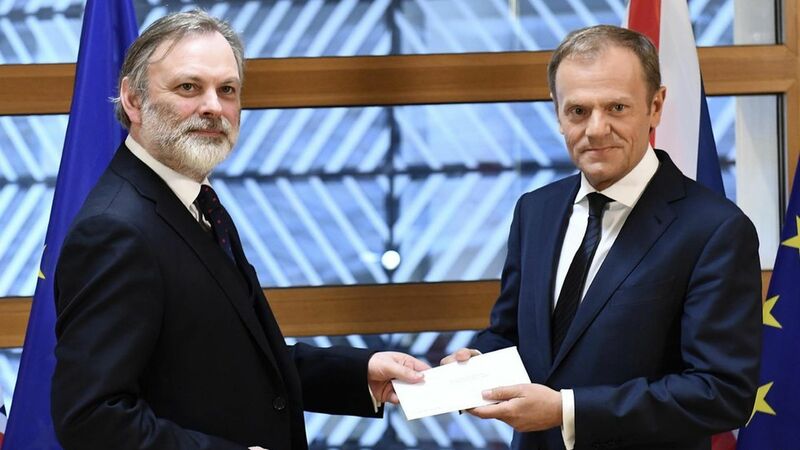 The British ambassador to the European Union, Sir Tim Barrow, officially delivered the U.K.'s notice of its intent to leave the E.U. to European Council President Donald Tusk this morning. The clock is now running on the nation's exit from the E.U., which has to occur within 2 years, though E.U. representatives have called for negotiations to be completed within 18 months. In a speech to the House of Commons, Prime Minister Theresa May called today a "great national moment" that "requires a great national effort." She called for the nation to come together to build "a Britain our children and grandchildren are proud to call home." Tusk concluded his post-delivery press conference by saying, "What can I add to this? We already miss you. Thank you and goodbye."